Among the many services that RePEc provide, the RePEc Author Service (RAS) holds a special place. Indeed, this services provides multiple utilities for the authors, the other RePEc services, the general user community, and beyond. This blog post goes through some of these utilities. RAS is pretty much the first service in the scientific community at large that has been providing since 1999 self-serve author identification. Once an author is registered, a RePEc Short-ID is created. This unique and permanent code is then used throughout RePEc services as well as by others (for example, Wikipedia, WikiData) to uniquely identify authors. When authors register, they claim as theirs the works that are suggested by RePEc. This function is important as the author name listed on a particular work may be shared by several people, especially if only the initial of the first name is provided. Even with a full first name, there are many homonyms in the profession, see a list of examples here. Thanks to author registrations, RePEc has information about the name, affiliation and work of authors. This information is used by the various RePEc services to create author profiles that allow to link people, institutions, and works with each other. This provides users more options when they are browsing through the bibliographic databases that are the core of RePEc. Registered authors are notified every month about newly found citations, along with various statistics about the visibility of their works. Users can also receive news about their favorite authors: MyIDEAS allows to to follow additions to authors’ profiles, among other things. The credentials that authors have with RAS can be leveraged elsewhere thanks to the OpenID protocol. This is in particular used by other RePEc services wherever a login is required. For example, this is used by MyIDEAS for the user-specific services it provides, by CitEC for the submission of references, or by the RePEc Genealogy to crowd-source its content. All the data is collected (author profiles, affiliations, citations and more) are used to compute various rankings that have become quite popular. Of course, this means that authors need to keep their profiles current with any work additions and affiliation changes. Author data is used for determining co-authorship networks (CollEc project), create an academic genealogy tree for economics (RePEc Genealogy), as well as for research on the economics profession (works using RePEc data). The vast majority of the data gathered in all of the above is supplied by authors and publishers. All activity is logged and reviewed. But mistakes can happen, and the RAS administrator welcomes emails with correction suggestions. In additions, authors with whom RAS has lost contact (listing) need to enter their new email address so that they can continue receiving their suggestions for newly discovered works. Note that those authors do not count towards institution and regional rankings, as having an expired email addresses indicates that the person has moved or died. In both cases, the RAS administrator welcomes notification of the new address or death. The maintenance of the profiles of deceased authors is taken over by an administrator (listing). RePEc is always looking for ways to offer more useful services to the Economics community. One suggestion that we receive on a regular basis is to make is possible to add public comments, “user notes”, about the papers disseminated by RePEc. In this blog post, we offer a proposal for such a feature on IDEAS, with proposed rules and a poll to see whether the Economics community would be interested in this new feature. This should give the opportunity to readers of the papers to offer their comments, for authors to provide clarifications, for conference discussants to provide their thoughts to a wider audience, and even for referees to make public their reports, if they wish so. A RePEc user account (RePEc Author Service) with clear identification is necessary to post a user note. There is a delay of a day between the creation of an account and the privilege of posting. Posts retain the name of the poster even after deletion of the account. Posts should remain professional and on topic. Readers can report abuses to moderators (no registration required). The text of moderated posts will become invisible, with poster name still visible and reason for moderation declared. Posters can appeal moderation decisions. Registered authors and previous posters in a thread will be alerted about a new user note. Authors have the opportunity to opt out of alerts for the associated paper or all their papers. A bulletin board is available to see new user notes. Boards are also available by subfield (if no subfield can be determined automatically by JEL codes or NEP reports, the first poster can set the subfield). A user note posted for one version of a paper will be visible for all versions of that paper. User notes are in plain text, with no attachments and no links, of at most 5,000 characters. Posters can thread several posts, though. There will be no counting of points, likes, upvotes, scores, or other games associates with this. This set of rules can change as experience warrants, after consultation with users. This poll is open until 26 December 2018, midnight CST. Addendum: The poll is now closed. We will work over the next months to put the user-note feature in place. Beyond the open bibliography that lays the foundation of RePEc, various services have emerged that enhance the data collected with RePEc. One of them is the RePEc Genealogy. The goal of this initiative is to build an academic family tree for Economics, recording who was advised by whom, where and when. It thus tries to build links among the over 50,000 economists registered with the RePEc Author Service as well as the institutions listed in EDIRC. At the time of writing this, close to 13,000 economists from over 1000 programs are listed in the RePEc Genealogy. The data is collected by the community: The RePEc Genealogy is a wiki, and all you need is a registration with the RePEc Author Service to add information to it. You can make sure your own record is complete, add your students or whose of your advisor, or ensure that your graduate program or alma mater are properly recorded. Over 3,000 economists have already contributed to it. Go to the RePEc Genealogy crowdsourcing tool to participate and see some statistics about the genealogy. How is the collected data used? Of course, one can browse the site for information. But the data is also used in other ways: IDEAS uses it to complement author profiles, to compute rankings of graduate programs (publications from all years or last 10 years), a ranking of economist by graduation cohorts. Finally, data from the Genealogy is starting to be used for research, along with data from the rest of RePEc. You could be part of the data that you are analysing! For a listing of papers using RePEc data, see here. 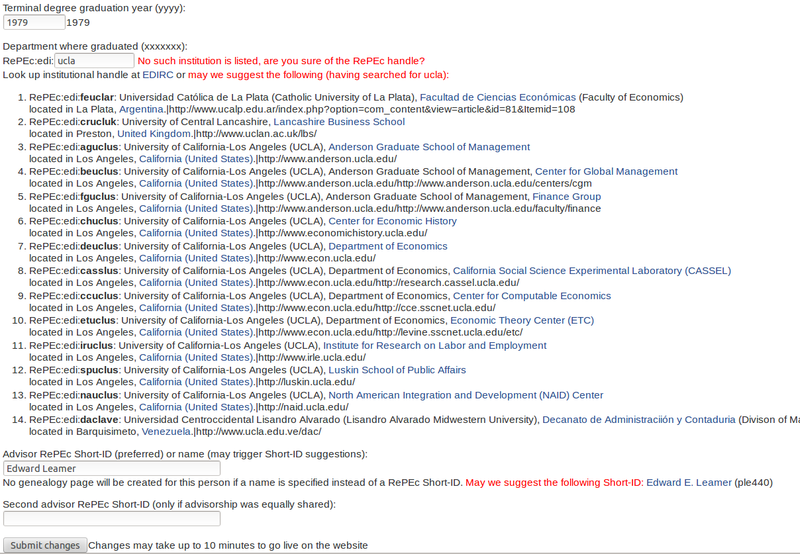 PS: The directory of economics institutions, EDIRC, has undergone a similar layout change. The RePEc Genealogy is an academic family tree of economists. It provides information about where and when economists obtained their final degree, and who advised them for the final degree. At the time of this writing, over 12,000 economists are indexed in the RePEc Genealogy. The data is crowd-sourced, meaning that anybody with a RePEc account can amend records, much like Wikipedia. Besides the curiosity factor of learning the background of economists, the assembled data is useful in several ways. One is that the data about the graduate programs is used to evaluate them. Close to 1000 are currently listed, and the research performance of their graduates is used to rank them. The data is also used by researchers for various analyses of the Economics profession. As mentioned, the site is crowd-sourced. This tutorial shows how you can help in contributing to it (click on images for a larger view). Click on Make additions and changes in the side bar to get to the log-in page. 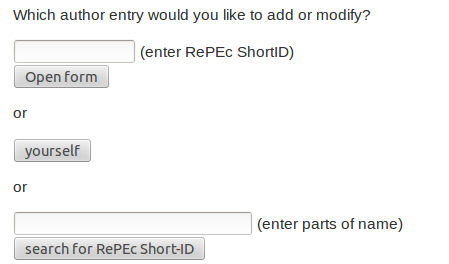 This is the standard log-in procedure in RePEc and requires your RePEc Short-ID. If you do not know you Short-ID, follow this tutorial (new window). Notice how there are several option, as there are several Richard Smith in RePEc. To ensure you have the right person, you can click on anyone’s link and it will open their IDEAS profile in a new window. Once you have the right person, enter their Short-ID in the first field and submit. Within 10 minutes the record will be created or amended on the live website. Buttons below the standard form allow you to amend further records, either by adding students that the person you just amended may have advised, or the advisor of this person, or anybody else, for examples other students who graduated from your program. You are currently browsing the archives for the Bibliographic features in RePEc category.